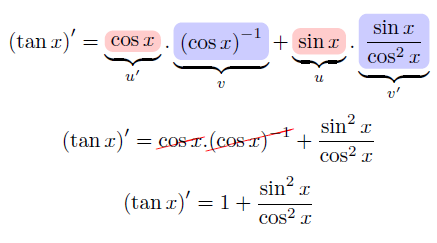 To prove this formula, we first express tan(x) as the quotient between sin(x) and cos(x). We observe that the expression above is a quotient. So, to calculate the derivative, we can apply the quotient rule. As I explain on that page on the quotient, I prefer applying the product rule in this case. This is because it is easier for me to recall the product rule. If I had to apply the quotient rule, I would need to look on the internet or a table of formulas to recall what the rule says. So, let's apply my method. Now we can apply the product rule. And that's is. This is an excellent example of how to apply my method of calculating derivatives of quotients for forgetful people. If you have a doubt or want to talk about a related problem, just leave me a comment below.